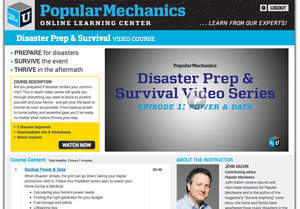 NEW YORK, NY--(Marketwired - Oct 9, 2013) - Popular Mechanics has announced the launch of PopMechU, an innovative online learning center, and its first in-depth video series, "Disaster Prep & Survival." Available now at www.PopMechU.com, this video course is the first of several planned for PopMechU, and marks the first time Hearst Magazines has ventured into the online learning experience. "Consumer education is a very natural place for Hearst Magazines to be involved," said John Loughlin, executive vice president and general manager of Hearst Magazines. "Our readers constantly look to our magazines and their editors for advice, practical information and inspiration. It's the perfect moment to leverage those strong consumer bonds against the technological advances in delivering on-demand video learning." The "Disaster Prep & Survival" course is comprised of five individual video lessons available on-demand that will guide viewers through what they need to know to prepare and protect themselves and their families -- and how to get their lives back to normal as soon as possible after a natural disaster strikes. The lessons are hosted by Popular Mechanics contributing editor and disasters expert John Galvin. Guest appearances include Mykel Hawke, former Green Beret combat medic and star of "Lost Survivors," a new Travel Channel series; Miriam Arond, Good Housekeeping Research Institute director; Mark Chisholm, ISA-certified arborist; and many Popular Mechanics expert editors, including Editor-in-Chief Jim Meigs, Senior Home Editor Roy Berendsohn and others. "Food & Family": Essential ingredients for your survival. "Home Prep & Recovery": Simple steps to secure your home before the event and to clean up your property safely once it has passed. "First Aid & Home Security": How to keep your family healthy and safe. "Backup Power & Data": Follow this action plan to power your home during a blackout and to safeguard key digital information. "Chain-Saw Basics": Learn how to use this critical power tool safely and effectively. Plus, more than 100 downloadable pages of advice, tips, checklists and worksheets to have on hand in the event disaster strikes. "Hurricanes, floods, wildfires, tornadoes and other disasters can turn a region upside down in a day," said Galvin. "Hurricane Sandy taught us that for some unlucky families the crisis may last for weeks if not months. Smart disaster planning can help you thrive -- not just survive -- in the aftermath, and we created the 'Disaster Prep & Survival' video course to help you do so." PopMechU's "Disaster Prep & Survival" is based on "How to Survive Absolutely Anything," the April 2013 cover story -- which is part of the magazine's ongoing coverage of disaster preparedness -- and was created to offer a more in-depth, engaging learning experience. The video course is available for purchase now for $49. Popular Mechanics empowers readers to navigate the increasingly complex, technological world around us. The magazine, published monthly by Hearst Magazines, inspires, instructs and influences nine million curious readers. Their mindset -- the hunger to know, the desire to investigate and learn -- drives them to explore, experiment and experience a wide range of interests. Issues engage readers with breakthroughs in the latest innovations in science and technology; educates with informative "how-to" stories on automotive, the home and digital technology; and motivates action with product reviews and comparison tests of the newest equipment and products. Popular Mechanics is also the #1-ranked men's monthly magazine when it comes to reaching an environmentally conscious audience. The brand is a 21st-century must-read, with a robust website (popularmechanics.com) and an award-winning tablet edition. Follow Popular Mechanics on Twitter @PopMech. Hearst Magazines is a unit of Hearst Corporation (www.hearst.com), one of the nation's largest diversified media and information companies. With 20 titles in the U.S., Hearst is the leading publisher of monthly magazines in terms of total paid circulation (AAM 1H2013) and reaches 84 million adults (Spring 2013 MRI gfk). In addition, the company publishes nearly 300 editions around the world. Hearst Magazines Digital Media, dedicated to creating and implementing Hearst Magazines' digital strategy, manages more than 24 websites for brands such as Cosmopolitan, Popular Mechanics, ELLE, ELLE DECOR, Esquire, Good Housekeeping, Marie Claire and Seventeen, as well as digital-only sites such as Delish.com, a food site in partnership with MSN; MisQuinceMag.com; and RealBeauty.com. Hearst Magazines has published more than 150 apps and digital editions for the iOS and Android platforms. The company also includes iCrossing, a global digital marketing agency.